Click the button below to add the 1/2" Hexagon Templates to your wish list. 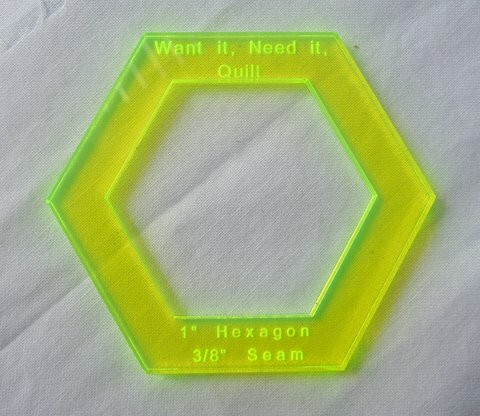 A great template for use with 1/2" sided hexagons. The design is perfect for fussy cutting fabrics. The template has 3/8" seam allowance. Hello my name is Kayt and I'm a Hexaholic. I've been using a templastic template of my own creation for some time now. It's been ok, but by its very nature it's almost see through and at times very difficult to see. These amazing templates from Want it, Need it, Quilt Store are fantastic. So easy to see among the clutter, er, "Notions."